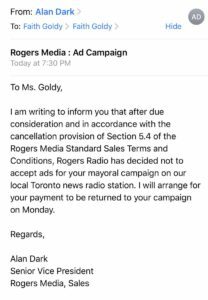 Rogers Media is the second broadcast outlet to reject election ads from Toronto mayoral candidate Faith Goldy. The CRTC needs to take care of this. This action of banning a political candidate who is lawfully running for office is an afront to our democratic process. These media conglomerates should not have the power to do such and must be SEVERELY REPREHENDED, a few million $$$$ in fines will help. 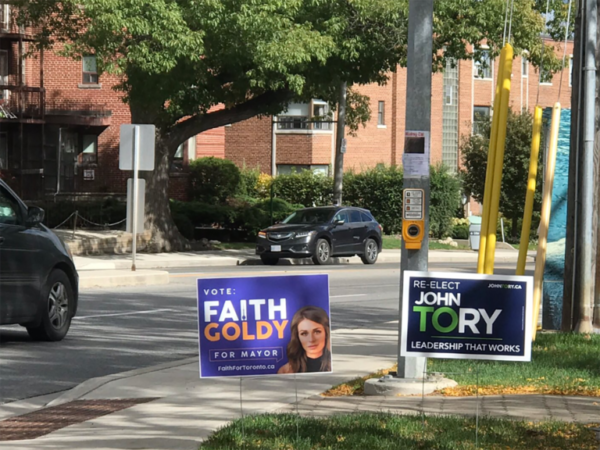 The more the liberal media colludes with the establishment at Toronto City Hall to exclude Faith Goldy from mayoral debates and to silence her and treat her as a “non-person” (similar to what the USSR did to political opponents), the more it will be to their own detriment in the long run. The way they’re acting toward Faith right now in protecting John Tory – first ignoring her, then laughing at her and now fighting her at every turn – is exactly how they operated against Donald Trump in 2016, but all to no avail. The CRTC? What a useless pile of steaming ….. I sent them a letter of complaint when CKNW used the term “$hith0le” all day a while ago. They sent me a letter saying it is perfectly OK to use. So, the CRTC is a “$hith0le” operation in my books. In my books, it ranks right up there with Human Rights Tribunals as collective for twits and NPCs. I hope she wins. That alone will be the slap in the face that the corporate media needs to wake up.